Huntsville, AL-Riverstone Solutions, Inc. was selected as a 2018 Small Business of the Year Contender by the Huntsville Madison County Chamber of Commerce. This prestigious honor is given each year to only a handful of companies, across several business categories. Categories include: Young Professional of the Year, Nonprofit of the Year, Technology Business of the Year, Professional Services Business of the Year, Culinary Business of the Year, Emerging Business of the Year, Government Contracting – Professional Services Business of the Year, Government Contracting – Technology Business of the Year, Service Business of the Year, Local “Creative” of the Year, Medical Practice of the Year, Woman-Owned Business of the Year and the Russell G. Brown Executive Leadership Award. Hundreds of companies are nominated by the community but a select few are chosen as contenders after an extensive application and review process. “It is truly an honor to have been nominated and selected as a small business of the year finalist. This demonstrates that Riverstone Solutions is an integral part of the Huntsville community and providing exceptional professional services that are recognized as top-notch by our peers and the community”, commented Angela Rittenbach, President and CEO of Riverstone Solutions. The Huntsville Madison County Chamber Small Business of the Year awards ceremony is a ‘black tie’ event held once a year in Huntsville, AL. 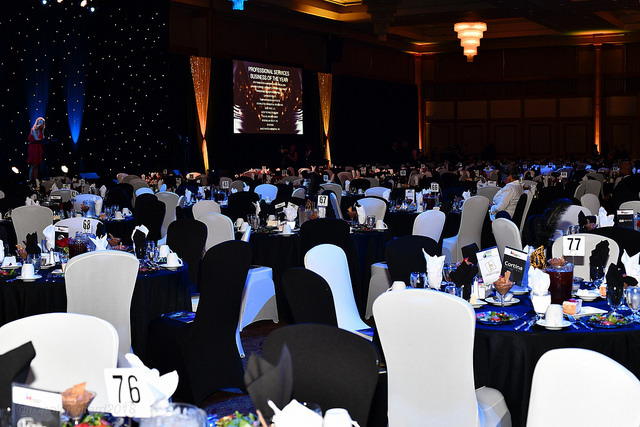 It is one of the mainstay annual gatherings in the Huntsville community including a formal dinner with networking events held before and after. The 2018 awards ceremony was held on August 14 at the Von Braun Memorial Center as a Masquerade Ball theme called “Let’s Party Huntsville”.